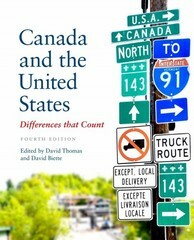 Canada and the United States 4 Edition Canada and the United States: Differences that Count investigates why and how the United States and Canada--while so close and seemingly so similar--remain different in so many ways. In seventeen analytical yet readable chapters, leading authorities look at the American and the Canadian ways of doing things. The questions they address affect us all in ways great and small: as citizens, as students, and as policymakers. Our similarities and our differences are not always as we have assumed them to be, and this volume helps us learn from one another's experiences.The fourth edition features new chapters on taxation, revenues, and budgets; health care; banking and financial regulation; legislatures; foreign policy; prime ministers and presidents; and state-province comparisons. Every chapter has been updated to take into consideration major developments and changes since the third edition, including the economic meltdown of 2008, changing electoral outcomes, new census data, and new policy directions in both countries--especially concerning health care and the environment.